In 1894, a year noted for the opening of the Tower Bridge and the Manchester Ship Canal, but more significantly the year Coca Cola was first bottled! ; the game of golf was growing in popularity with a number of golf clubs already having formed in the Manchester area. 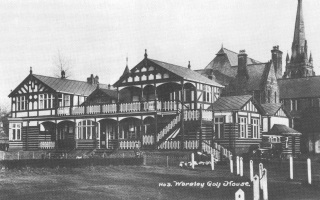 A meeting at Monton Memorial School, on 20th March 1894, instigated by local businessman Mr H Stafford Golland, led to the inauguration of Worsley Golf Club. A site for the course has already been ear-marked at Broadoak Park; part of the Earl of Ellesmere's estate. The newly formed committee duly appointed Mr Golland as Secretary and later the Earl of Ellesmere as President. Events moved quickly, a week later the committee commissioned George Lowes, the Professional at St. Annes Golf Club, to design the course. Work commenced immediately with the greens completed at a cost of £20.15s.8d, and the first match took place on the new course on 28th April 1894. Membership fees were set at an annual subscription of 1 guinea, with a joining fee of 2 guineas, and managed to attract an initial membership of 124. After initially renting a room in the lodge at Monton Green the Club finally acquired its own pavilion in 1895, the building being erected where the present men's locker rooms are located. This in turn was replaced with a new Clubhouse in April 1897 at a cost of £1300. There were no further alterations to the Clubhouse until a substantial extension in 1923. The original pro-shop, which housed both the Professional and caddies, was the pavilion from Monton Cricket Club; purchased in 1901 for the sum of £7.10s.0d. This was replaced in 1913 by the current pro-shop.